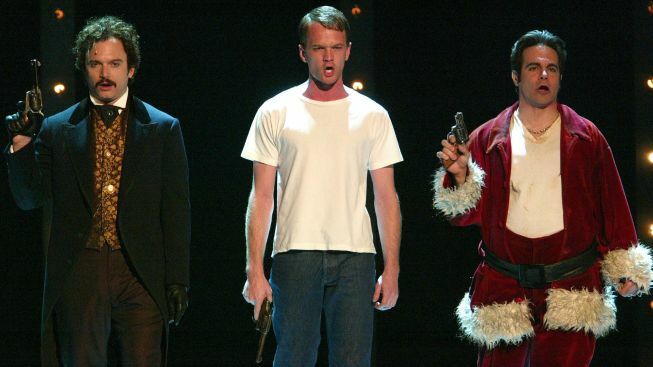 Killer performances: Michael Cerveris, Neil Patrick Harris and Mario Cantone in the 2004 Broadway production of "Assassins." The cast will reunite for a benefit on Dec. 3. Broadway’s biggest guns will be back for a one-night-only reunion benefit performance of “Assassins,” the unlikely Stephen Sondheim musical about the men and women who attempted, some with more success than others, to kill American presidents. Neil Patrick Harris, Michael Cerveris and Denis O’Hare are among the troupers from the 2004 production expected on hand for a Dec. 3 performance at Studio 54, a benefit for the Roundabout Theatre Company’s musical theater arm. Cerveris, who will reprise his role as John Wilkes Booth, recently spoke to NBC 4 New York about working with Harris (as Lee Harvey Oswald) in the 2004 production, which earned five Tonys. As Booth, Cerveris was called upon to shoot himself in one scene and fall to the floor. One night, enacting his death during a benefit performance for The Actors Fund, Cerveris fell with too much force and split open his forehead. The Dec. 3 event will feature musical direction by Paul Gemignani. Benefit tickets start at $1,000 and include admission to a post-show cast party. Select orchestra and mezzanine tickets ($150-$500) are also available to the general public by calling Roundabout Audience Services at 212-719-1300 or online at roundabouttheatre.org. In other news for fans of Harris and Sondheim, word came today that the New York Philharmonic’s 2011 concert staging of Sondheim’s “Company,” which starred Harris, Patti LuPone, Stephen Colbert and others, will be released on DVD and Blu-Ray come Nov. 13.